For a long time people associated weight loss with fasting. In fact the whole concept of dieting meant to fast and lose weight drastically. It is only in the late 20th century that the doctors, nutritionists and health experts redefined the concept of dieting. The present day weight loss advice incorporates a proper and balanced diet with mostly frequent meals and intermittent health snacks. It works well if you are disciplined about what you are eating and carrying on with regular workouts. But with so many personal and professional commitments it may not very easy to stick to a routine like this in the long run. If there is a need to lose weight drastically and fast, then the usual sedate methods won’t work. What the body needs, to be shaken out of its stupor, some drastic action. One can get a taste of it from the 5:2 diet which is shakes up the system, increases metabolic power and helps in weight loss naturally. 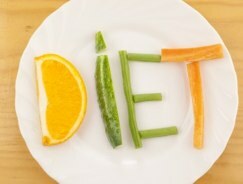 The main idea behind the diet is to eat merrily for 5 days and fast for the next 2. In reality, most nutritionists will advise that you don’t really fast but undergo severe calorie restriction for these two days to make up for any excesses that you may have had in the past 5 days. Also called the intermittent fasting diet by some, it is a concept which has long been in use by several religious and cultural norms over the centuries, where rituals paved the way for good health when events would lead to excessive indulgences. Ideally, the 5:2 diet allows one to have whatever they wish on the 5 days of normal diet. This means that one can eat and drink as much as they wish and have all kinds of food without worrying about fats ad calories. After these five days would come the two days of fasting or restricted diet. For men the restriction means they have to stay within a 600 calorie diet and for women it means that they have to stay have within a 500 calorie diet. How you organize your meals and distribute your calories is up to you as long as you do not cross the upper limit of your diet restriction. One can start the day with a heavy breakfast of bacon and eggs, have a light lunch and a very simple and early dinner like soup or salads. Grilled fish or meat with vegetables makes good light meals which fill you up but do not add to the calorie quotient too much. What works is that this diet gives enough leeway to gorge on the good foods without any worries. The body can always make up for these excesses when it goes through the two days of restricted dieting. Research has shown that this diet leads to drastic weight loss if followed carefully. One can even lose up to 14 pounds in six weeks like Dr. Michael J. Mosley. 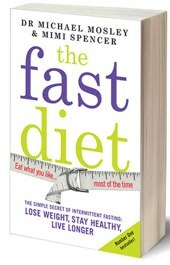 Michael Mosley is the co-author of the book “The Fast Diet”. He experimented on this diet himself when he tried out the formula of intermittent fasting for six weeks. In the very first week he lost 2 pounds and got more motivated to stick to the diet. In another six weeks he lost a total of 14 pound which was 25% of the body weight he had before. His blood sugar and cholesterol levels also improved which shows how beneficial the diet is to keep both fit and healthy. Experts say that this could be the one diet which can also fix eating disorders like anorexia and bulimia. The principle behind the diet is that once the body goes into the fasting mode it stops storing fat. In fact, after some time it turns towards the stored fat to get the requisite calories and energy to sustain itself. 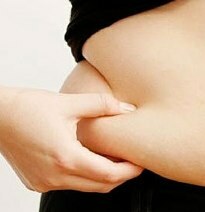 Thus, very naturally the fat burning system is turned on and all excess fat is slowly drained away from the system. After five days of eating what you can the two days to diet gives the body a chance to repair and recover its lost equilibrium. Since the restricted diet is only temporary there is no real fear of hunger. Besides, even though it is called the fasting diet no one really fasts. Think Lent and you will get the picture. In the long run, one will not only lose weight but also lead a healthier life with lower cholesterol and blood sugar levels, lesser risks of cancer, cardiovascular diseases and increased stamina for leading a more active life. Of all the diets we have reviewed this is one of the hardest to persevere with but also one of the most rewarding. If you want almost guaranteed weight loss method – try this. 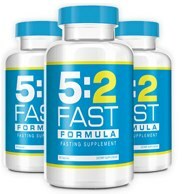 A product that is particularly effective either on its own or used in conjunction with the 5:2 Diet is the 5:2 Fast Formula. It is an appetite suppressant that is made from Konjac root and minerals an vitamins. 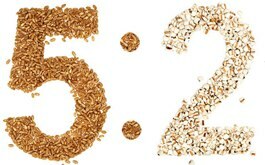 The 5:2 Diet is often criticised for its difficulty and that is may deny or deprive users vital nutrients – the 5:2 Fast Formula solves both counts.